The Atlantic recently referred to Christopher Hendon as “specialty coffee’s resident scientist.” As of August, he’s our scientist—but his research focus isn’t coffee. The first of three new faculty hires for the UO’s Energy and Sustainable Materials Initiative, Hendon searches for innovative answers to vexing energy problems and cheaper, greener ways to make batteries, solar cells, and other products. You may think this sounds like a quantum leap from lattes—but he will convince you that it’s not. Hendon’s research in porous materials and surfaces could lead to new designer materials or more sustainable manufacturing. For instance, an atomically thin coating of platinum (a precious metal used in catalytic converters) might work just as well as a larger piece. That means lower costs and less mining. Tiny holes in porous materials may hold clues to cheaper batteries or new ways to store hydrogen that may eventually fuel your car. He’s already begun his innovative, cross-disciplinary research using computational chemistry—think experiments with supercomputers instead of chemicals. And he’s eager to start teaching undergraduates. How does a chemist become obsessed with lattes? It all started in 2012 at the University of Bath in Somerset, England, where Hendon was working on his PhD. His roommate’s coffee was terrible, so Hendon Googled “good coffee” and found a café where he befriended co-owner Maxwell Colonna-Dashwood. 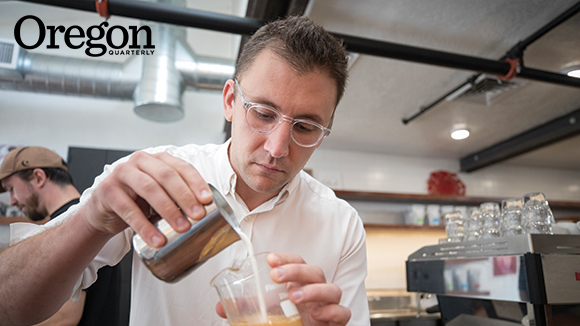 The two started working toward better espresso through chemistry—a partnership that continued after Hendon left to do postdoctoral research at MIT. They went on to win national barista championships, coauthor a book about water chemistry and coffee, and advance the art and science of espresso worldwide. In Oregon, he’s already made contact with local roasters and has no plans to kick the habit. Want better coffee at home? Buy local beans, says Hendon. They’re fresher—and roasted to harmonize with the chemistry of your local water. Ratios are also crucial. Start with 15 grams of freshly ground coffee (yes, use a scale) for every cup of water. Heat your water to 200 degrees Fahrenheit. Experiment by changing one variable at a time.